Welcome to Baby-Safe.net. This site has one primary objective: keeping your baby or small child safe. 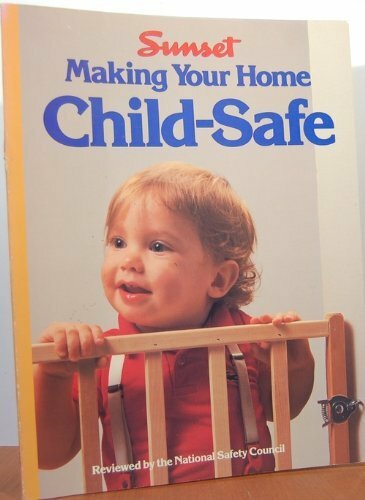 Here you will find expert advice on “babyproofing” (or “childproofing”) your home, removing hazards from the yard, and ensuring that your child’s gear and furnishings are safe. Accidents happen. But when little ones creep, climb, toddle, and scamper through the house or yard, the accident rate usually goes up. Children themselves, innocent, inquisitive, and into everything, are half the equation. The other half shows up in our homes in ordinary circumstances—a lamp that tips, a tablecloth that drapes, laundry detergent left within reach. That’s where childproofing is critical. On this site we will take you on an in-depth childproofing tour, room by room and area by area. We’ll show you how you can make your home and outdoor property safer for young children. Please note, however, that the information on this site is not intended as a substitute for the personal supervision of your child. Never leave a small child unattended, even in the most carefully childproofed environment. No amount of information can cover every conceivable present or future hazard to children. Use this information as a guide, and use your own common sense as the final arbiter of what you should and shouldn’t do to ensure your kids’ safety. Psychologists have compared a parent’s role to that of an athletic coach. In the case of young children, “lifeguard” is sometimes a more appropriate job description. Early childhood is a period for parents to be especially vigilant as their little ones constantly grab, topple, climb, taste, and get into everything they can find. From about 18 months to 2 1/2 years, children have more accidents, simply because they’re increasingly active without much understanding of danger. If you say “no” at these early ages, they may momentarily know what you mean, but be aware that they won’t remember it for long. Anticipation. Basic to keeping small children safe is knowing generally what to expect of your youngster’s developing skills with each stage of growth. Even so, you’ll often get taken by surprise. For example, one day you may find that the bumper pads around baby’s crib have now become a boost to climbing out. Individual differences. Like the rest of us, little children are individuals with a wide range in rates of development. Some talk early, some walk early. Some are adventurous, some more cautious. Some are agile, some more awkward. Some kids just seem to be naturally accident-prone, while others steer clear of trouble. Who gets hurt? Generally, daring, aggressive kids get into more mischief than timid or reserved kids. But accidents are more likely to happen to any child when the child is under stress—at someone else’s house; during an exciting event, when he or she is tired, hungry, or frustrated; or there’s any strain or instability at home. 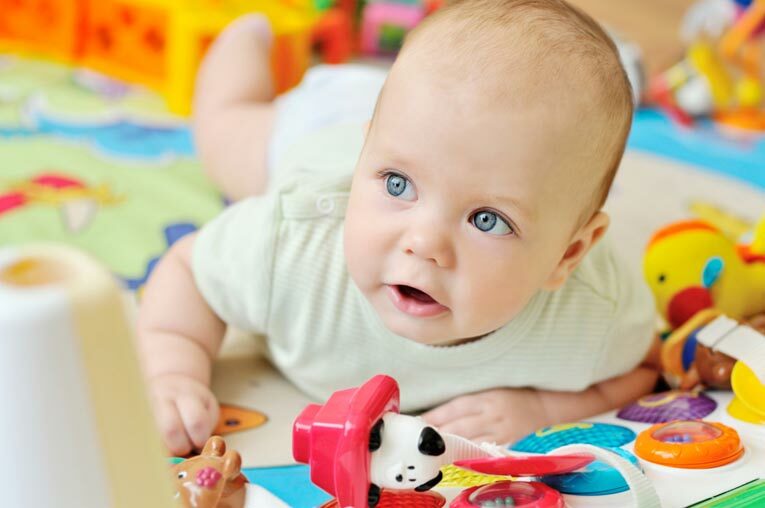 Curiosity is the essence of learning, and babies seem to have more than their share. From the moment they’re introduced to this complex and fascinating world, they start their quest for information. Everything around them is new and interesting, eagerly seen, heard, touched, tasted, or sniffed. As babies develop the skills of reaching and grasping, then moving about, both their ability to gather more information and their potential for accidents take a giant leap forward. Bassinet can be a cozy bed for naps, but isn’t ideal for regular sleeping because it is too small and can be tipped. Wrigglers. During the first three months of life, newborn babies lack the mobility to get into much trouble. They reach out, wriggle, smile, cry, eat, fill diapers, and wake their parents. They arch their backs and dig in their heels. Most movements are reflex actions, but they can be enough to carry an infant off a changing table if you’re not standing protectively by. Babies who have never rolled over one day can do so unexpectedly—and quickly. Most accidents at this age can be prevented by constant vigilance. By the third or fourth month, wriggling babies can hold their heads upright, as well as grasp things and get them into their mouths. This is the time to survey the world from your child’s point of view. Stray pins, buttons, coins, bits of string, and stray peanuts that have lodged under furniture or in deep-pile carpeting all present a significant choking hazard. Creepers and crawlers. Sometimes as early as the fifth month, babies start moving around in earnest. At six or seven months, babies learn to sit up on their own. They pick things up more carefully, between thumb and forefinger, and study them. They like to drop things, too. You can tell they are developing memories and starting to learn from experience. 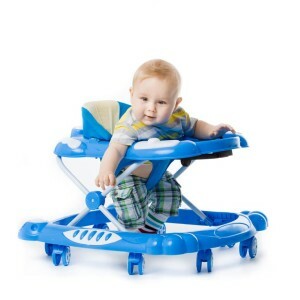 Baby walker can be safe as long as you keep an eye on your baby and make sure he or she can’t get near doorways or stairs. As mobility increases—often faster than you might expect—babies begin to creep and crawl. Each child has an individual style of locomotion; a few choose not to creep at all, just to walk when they’re ready. This new mobility signals the time to make sure your entire house is baby-safe. On any day, your crawler may open a cabinet or decide to inspect an electrical outlet. New physical efforts lead babies to pull things over on themselves, and to fall down a lot. Fascination with tasting continues and babies keep putting everything possible into their mouths. During this period, baby’s first tooth will probably arrive and, with it, an urge to chew. Walkers. Toward the end of the first year, activity becomes more constant, and babies usually start walking sometime around their first birthday. Baby can now get into almost everything within reach. But the child still can’t perceive danger with much realism. Mobility is not balanced with good judgment. Your job now is to encourage baby’s exploration and thirst to learn, while providing the safest possible context. The key is to protect without stifling or scaring. Baby gate keeps a toddler from stairs or off-limit rooms. As baby starts walking, many parents start teaching the meaning of no for the first time. Most child guidance experts agree that, to be effective, no should be used sparingly, consistently, and mainly when children’s activities endanger themselves, others, or valued objects. But don’t rely on no as your sole safeguard. Be ready to follow it up by calmly but firmly removing either the object or the child. Explorers. Armed with mobility and more than enough energy for the whole family, a toddler starts testing independence in the second year, as well as trying out all kinds of new behaviors and skills. These little explorers work daily to refine their walking, talking, and visual perception. They learn to climb on tables and up bookcases. They race from one activity to another, experimenting with whatever they can lay their hands on, from tap water to cat food. As ages two and three roll around, children become full-fledged explorers eager to get into everything. They still have only a limited awareness of danger. Though they may understand simple rules, you can’t rely on them to consistently remember or mind. At this age, most parents use gentle discipline to set limits.